12 WATERFALLS + 8 ZIP LINES+1 HOUR HORSEBACK RIDE = CRAY DAY!! The Waterfalls of Damajagua are one of the top rated activities on the North Coast of the Dominican Republic! Over the centuries, mother nature has crafted these awe inspiring pools, etched out of limestone, with stalactites and stalagmites in a thousand colors. After pickup and once we've arrived to the visitor center we'll gear up and hike about 40 minutes uphill to start making our way back down by swimming, jumping, and sliding through the first 12 refreshing waterfalls and sluices. For those who don't want to do the highest jumps there are walk arounds. 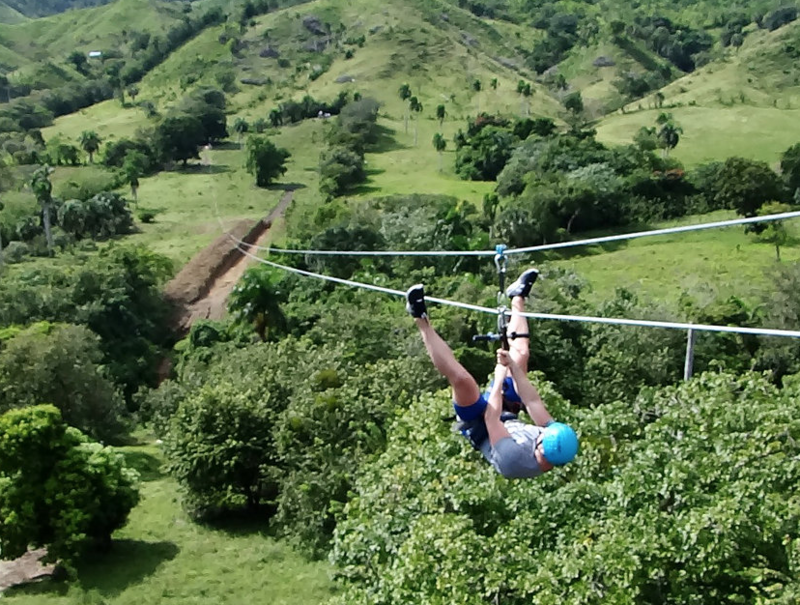 When we've finished at the falls you'll change into dry clothes and shoes and we'll head to the Zip Line Country House for a delicious, home-cooked Dominican lunch buffet including rice, beans, chicken or beef, fried sweet potatoes and yucca,vegetables, tropical fruits and more! 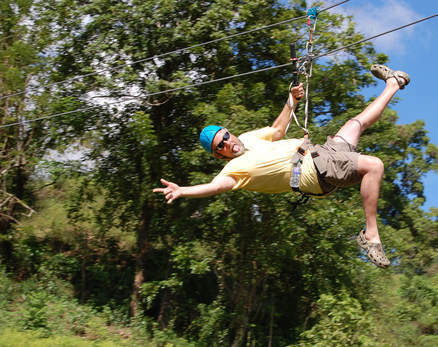 And then....your thrilling zip line adventure begins! A bottle of fresh drinking water will be attached to your harness, to make sure you stay well hydrated during the activity. After the safety briefing, it's time to feel the rush of 8 zip lines (ACCT certified), with a total of more than 7,900 feet of double, galvanized aircraft steel cable. The longest ride is 2,460 feet. No experience is required. Water included throughout the day. But you're not done! 12 amazing waterfalls, lunch and 8 thrilling zip lines and it's time to mount up for a relaxing countryside horseback ride, with breathtaking views. The horseback ride included in this package is meant to be for beginners and children as well. We take the time to provide full basic riding instructions and depending on riding skills and experience, the right horse will be found for everybody. After the ride a walk through the botanical garden and we return you to your hotel! Important note: The name 27 "Waterfalls" is actually a mistranslation from the Spanish word "Charcos" that means pools not waterfalls, there are only in fact a total of around 12 actual waterfalls even on the full trip to number 27. 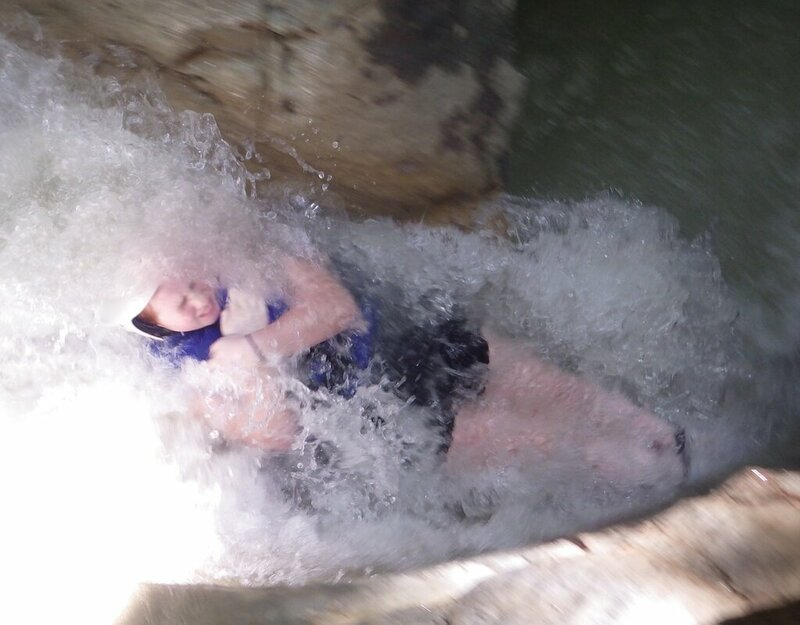 Included: Round trip transportation*, water throughout the day, all safety gear for cascading and zipping, experienced guides plus an authentic ﻿Dominican buffet lunch and local rum drinks on the way back to your hotel. Tour pick up times are provided with your booking confirmation. Tour lasts approximately 6 hours plus drive time depending on where hotel is located. Rated: Beginner. With reasonable fitness previous experience is not necessary. Minimum age 8. Swimmers only. Tours may not include transport costs from your location. on the day of your tour.